We educate people about our finite resources and why all of us should play a part in the stewardship of our planet’s future. Our mission is to help our congregation realize its stewardship of the earth by connecting its members and the community of Long Island to sustainable living. We have often co-sponsored several programs with other UUCSR Committees and environmental organizations in pursuit of this mission. 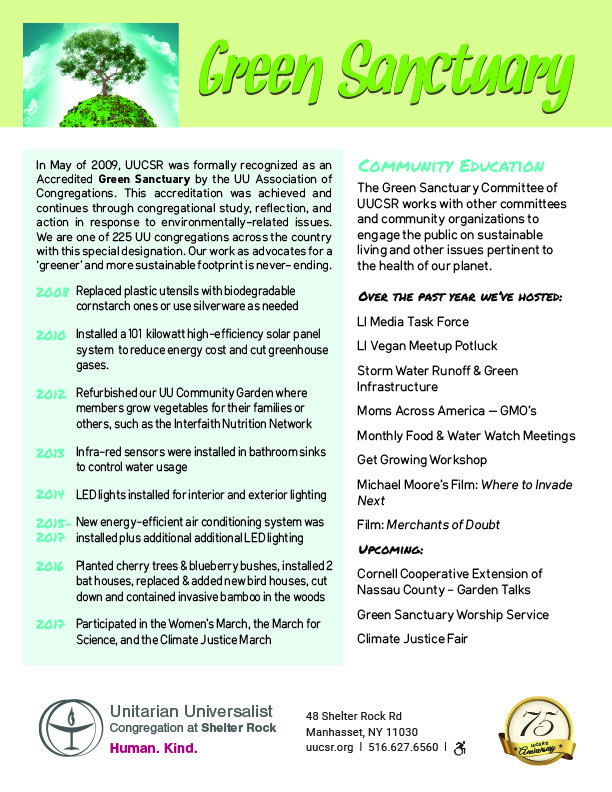 In 2009 our congregation was accredited as a Green Sanctuary by the UUA. We have surpassed their guidelines each year since and have managed to improve our premises indoors and outdoors. The Green Sanctuary Committee is aware of how important it is to save our environment.